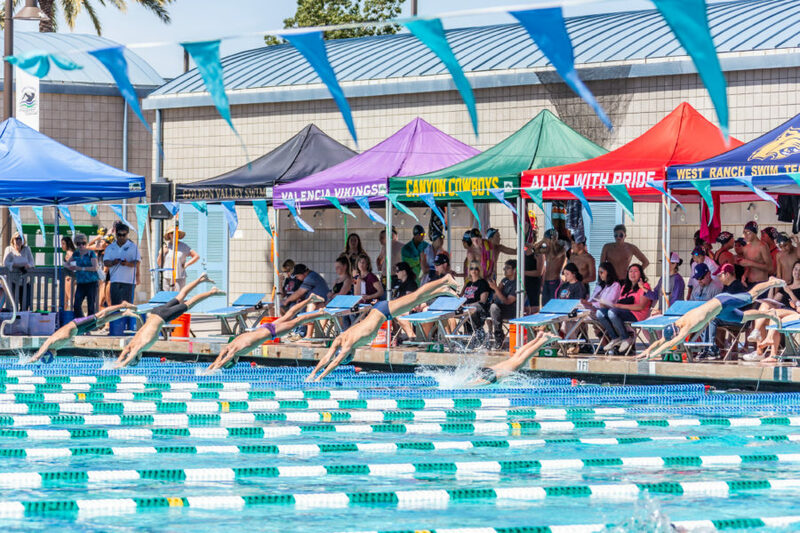 The Foothill League was well-represented in the Division 1 CIF-Southern Section swim prelims on Thursday at the Riverside Aquatics Complex in Riverside. Multiple swimmers and relay teams made it through to the finals. On the girls side, three relay teams made it through in the top nine: Valencia’s 200-yard medley relay (Jin Young Yi, Izabella Adame, Emma Hiett, Allison Cho) placed seventh, while two Hart relay teams made it through in the 200-yard freestyle relay (Alyssa Hamilton, Megan Soto, Genesis Lewis, Taylor Toledo) placing ninth and the 400-yard freestyle relay (Maxine Catig, Gracie Hill, Brooke Helgeson, Hope Hill) placing sixth. Reagan Nibarger of West Ranch made it through in the 50-yard freestyle (23.98) and the 100-yard freestyle (51.52) placing seventh and second, respectively. Maxine Catig also made it through in the 100-yard freestyle (52.26) placing eighth. Freshmen sensation Izabella Adame of Valencia also made it through in two events, placing ninth in the 200-yard individual medley (2:05.70) and sixth in the 100-yard breaststroke (1:04.22, All-American Consideration). Sophia Morici of West Ranch squeaked by, placing ninth in the 500-yard freestyle (5:03.26). For the boys, only one Wildcats relay team made it through to the top nine: Rijker Hutson, Cade Brower, Charlie Morici and Michael Andrizzi placed ninth in the 400-yard freestyle with a time of 3:10.11. Kevin Childs of Canyon was the biggest winner of the day for the boys individual events, taking two fifth-place finishes in the 100-yard butterfly (49.80, AA Cons) and 100-yard backstroke (49.81, AA Cons). Justin Morsch was the only Saugus swimmer that made it through to the finals, placing seventh in the 100-yard freestyle (46.23). The top nine qualifiers at prelims advance to the championship finals. The next nine move on to consolation finals, both of which are being held Saturday at 4 p.m. at the Riverside Aquatics Complex.